This winter the Red Cross will begin to distribute food parcels to the poor in Britain for the first time since end of the Second World War. The number of food banks in Britain, and the demands placed upon them have escalated in the past couple of years as families struggle with the effects of benefit cuts, food and fuel inflation and wage cuts. Before the austerity programme of the current coalition government, food banks were not a common feature of British life. Now there are over 700 spread across the UK. The charity Oxfam has estimated that half a million Britons have been forced to use food banks this year alone. All food banks operate strict criteria about access to the food they distribute, so it is the truly desperate who have come to rely upon them. The Prime Minister David Cameron has seen the development of the food bank network as an example of what he refers to as “The Big Society” in action. The reality is that food banks are a humanitarian response to a humanitarian crisis on our own doorstep. All food banks have collection points, with some collecting outside supermarkets, and they would welcome the donation of an item or two from your shopping if you can afford it, which will also be welcomed by those who will be enduring genuine poverty throughout the coming winter and beyond. This week’s recipe is for a seasonal pizza of artichokes and mushrooms. Artichokes are fiddly but rewarding to cook with but if you can’t face the prospect of preparing them it is possible to buy them ready prepared in delicatessens and some supermarkets. Frying the pizza base in olive makes it firm and crispy, and I can guarantee that once you’ve tried your pizza base this way you’ll never want to go back. 2. For the topping, heat the olive oil in a pan over a medium heat and add the finely chopped onion. Cook, stirring, for 5 minutes until the onion is soft and translucent. Add the garlic and cook for another 2 minutes before adding the passata, tomato purée and dried basil. Stir and reduce the heat to low. Allow the sauce to simmer gently for five minutes, stirring occasionally. Remove from the heat and set to one side to cool. 3. Pre heat the oven to 230 °C (450°F, gas mark 8). 4. Next prepare the artichoke. Cut off the base and trim away the outer leaves with a sharp knife. Slice straight across the top of artichoke approximately two inches down. Discard this part of the artichoke – it is the lower end we are interested in. 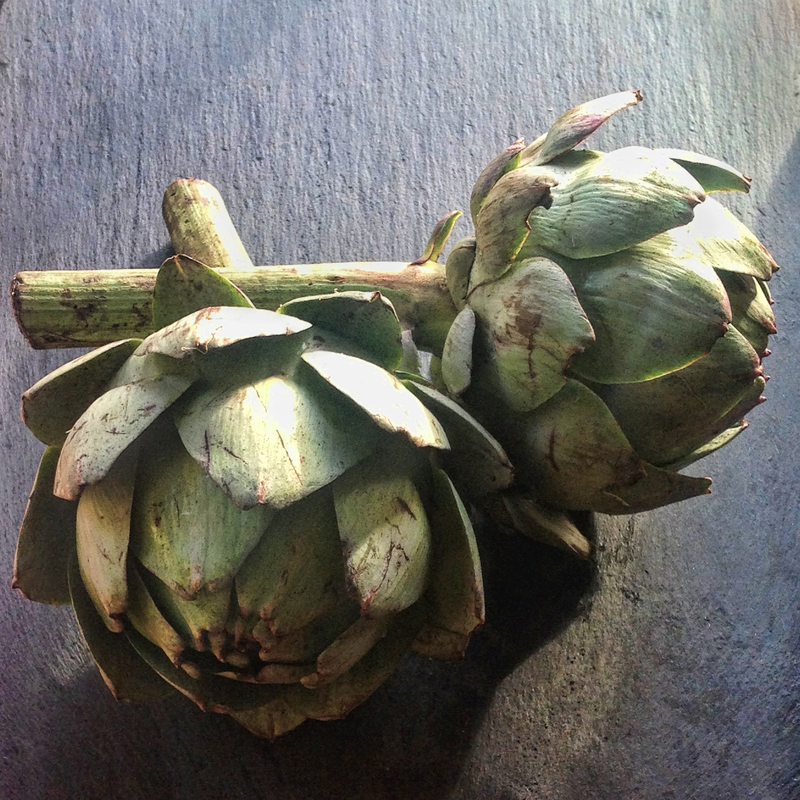 Using the sharp knife, cut away any remaining tough outer leaves until you are left with the artichoke heart. Working quickly, use the knife or a spoon to completely scrape away the prickly inside of the artichoke heart (this is known as the choke). Slice the artichoke heart into quarters and then halve each quarter. Rub the eight pieces of artichoke all over with the lemon quarters to prevent browning. 5. Heat a ridged griddle pan over a high heat. Brush the artichoke slices on both sides with olive oil. When the pan is hot, place the artichoke slices carefully across the ridges. Cook for 2-3 minutes per side until nicely charred. Remove from the pan and set to one side. 6. Punch down the pizza dough and place on a floured surface. Roll out into one large or two smaller thin circles. Pour 4 tbsp olive oil into a large frying pan over a medium heat. When the oil is hot, carefully add the pizza base. Cook for 2-3 minutes until the base is hard and slightly coloured, then turn over and cook the other side similarly. Drain briefly on kitchen papoer and place on a baking tray. 7. To assemble the pizza, thinly spread the tomato and basil sauce across the pizza base. Sprinkle the mushrooms evenly across the pizza, followed by the artichokes and the olives. Sprinkle over the taleggio and Parmesan and, finally, the dried oregano. Place in the pre-heated oven for 5-10 minutes until the crust is golden brown and the cheese is bubbling. Serve immediately.